Enhance well interpretation methods within the Petrel* environment. 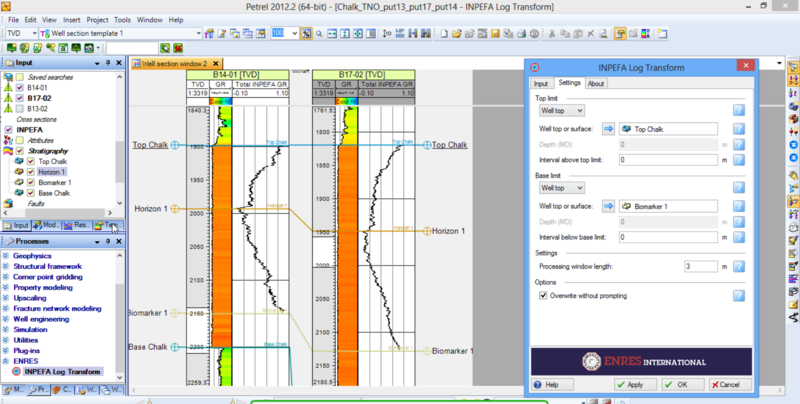 Use familiar workflows– INPEFA® is fully integrated with Petrel* functionality and workflows. Limit costs – No investment required to buy and learn a new software package. Obtain results quickly – INPEFA® can be applied to any type of well log and logs of different resolution, in just a few simple clicks. Limit bias – INPEFA® calculation is data-driven thus unbiased when compared to model driven interpretation. There are different scenarios for installing the INPEFA plug-in for Petrel*. And there are different versions of Petrel*. Therefore, different installers for the INPEFA plug-in are available. Here you can select and download the installer appropriate for your organization. Please download the user documentation and installation guide (pdf) here. This is the most simple situation where you want to use the INPEFA plug-in for Petrel* on a single device, most commonly a workstation. Please select the version of the plug-in that matches your Petrel* installation version(s). This is a situation often encountered by geo-consultants, traveling with a laptop and using several workstations. Please select the version of the plug-in that matches your Petrel* installation version(s). This option is best for corporate network deployments. Similarly to the deployment of the Petrel* license server, also the INPEFA plug-in can be installed as a service on the network, catering to multiple users and multiple devices. Please select the version of the plug-in that matches your Petrel* installation version(s).